Sheetrock and Drywall: Are They The Same? Sheetrock and drywall both refer to special panels that are fastened to wall studs to create walls, but they’re not the same thing — at least not technically! Here’s a little brain-teaser: All Sheetrock is drywall, but not all drywall is Sheetrock! That’s because Sheetrock is actually a brand name — patented by a company called U.S. Gypsum — kind of like Kleenex is a brand name that refers to tissue. We’re teasing though, because most builders and carpenters use the terms interchangeably! Both Sheetrock and drywall are made from flattened gypsum “plates” that are covered on both sides with heavy paper. 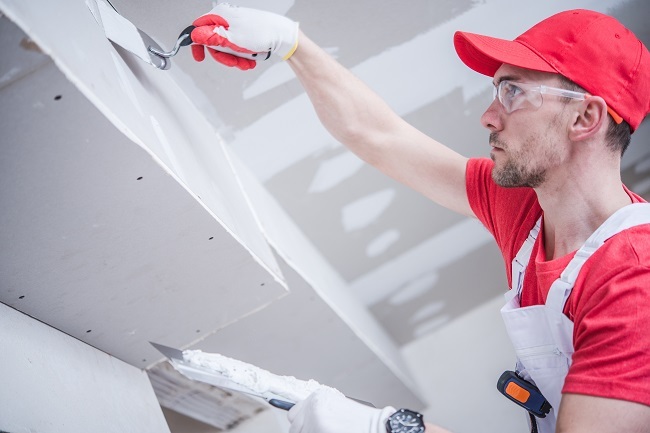 Drywall — and by extension Sheetrock — are pretty revolutionary, because back in “the day”, all walls were made with plaster, and usually required the services of a plasterer to ensure an even and smooth application. Drywall, on the other hand, is a more lightweight, easy to install product that even ambitious DIYers are able to erect, using a special paper or mesh tape to hide the seams between the panels. The tricky part, though, is applying and sanding the joint compound that hides the tape. Do it wrong and you’ll end up with lumpy, visible seams, and a wall that looks like an amateur put it together! The same problem occurs when a portion of a sheet of drywall is damaged, something that is more common than you might suppose. If the damage is small — say, a nail-hole left after hanging a piece of artwork on the wall — then it’s fairly easy to repair with a little spackle and some light and judicious sanding. But when the damage is more severe — like the damage when a heavy piece of furniture or other weighty object occurs and creates a large “hole”, it’s usually best to call in a professional — somebody who’s proficient at working to repair damage to drywall so expertly, that you’d never know there had ever been any damage when they’re through! That “somebody” is typically a professional painter or handyman. Here’s some good news for residents of the Frisco, Texas region. You’ve got access to both professional painters and professional handymen when you engage the services of Excellent American Painting and Handyman Service! We’re bonded and insured, and serve not only Frisco (our home base), but also Allen, Carrollton, Celina, Coppell, Corinth, Denton, Fairview, Flower Mound, Highland Village, Little Elm, Lewisville, McKinney, Plano, Prosper, and The Colony! Why not contact us today for an estimate on drywall repairs — or whatever is on your home’s “To Do” list? You can also give us a call at 214-938-1088 seven days a week!